After a slow start earlier this year, my musical life has picked up lately. I have been to a few things which have hitherto passed unblogged. On Saturday 13/3 I went to hear the SSO. A friend stayed away. “I’m sick of the Symphonie Fantastique,” he told me. I’m worried that perhaps my tastes have become likewise jaded. I am inclined to think that the work is best when it retains a power to shock and surprise, which is obviously a matter of diminishing returns. Nowadays I like the pastoral movement the most, which once I found rather boring. It was also the slow movement of the Ravel piano concerto No 1 (soloist Louis Lortie) which I enjoyed the most. The Franck “Accursed Huntsman” was a genuine rarety which I wish I’d taken more time to listen to before hearing it in the flesh. PS: regrettably (in my view), the Symph Fant was played with two tubas and sans ophicleide and serpent. was billed as a revival of (posthumously regarded) obscurities. Strictly, that applied to the Kozeluh and the Dohnanyi only. Of the two, perhaps the Kozeluh could really have been left in obscurity: it belonged to that period of piano music (Hummel, Weber, finally put to bed by Mendelssohn) which made a virtue of lots and lots of notes in a right hand line. The flute didn’t get much of a word in edgewise and Nathan Waks was positively wasted on the cello. I’ve left it too long to give an intelligent comment on the Isaacs, other than to say I liked it. The Poulenc was a more elusively reserved than my memories of the piece suggested. Some of that may be because of early and deep impressions heard from the other end of the house of sister tackling again and again some of the higher and more taxing passages but I have also had my own wrestles with the in fact not too difficult piano part? There is a kind of Delphic yearning in the music which you can lean into but which as a flavour is a bit like nutmeg – something you just can’t make stronger. The Dohnanyi was the sort of thing that you could imagine Schoenberg having written if he hadn’t moved on from Brahms. I found it very satisfying: there’s something about a skilful composer working with a style that he and we are very comfortable with, so long as comfort doesn’t become complacency, which it wasn’t. Regular players Olding, Morozova, Munro, were joined by Robert Johnson (horn) and Waks (cello) and David Rowden (clarinet) substituting for indisposed Smiles and McCorkill respectively. P and I both felt that DR had a bit of trouble matching his elders’ vigour of expression. He adopted a round and smooth tone, and a lot of lines which doubled with the horn were scarcely audible. I wonder if he simply misjudged this, because in the last movement he had no difficulty coming out of his box with a more jaunty and penetrating tone. The Bach (without a continuo cello – is this necessarily the way to do it?) came across as rather dour and made me feel just how far Thuringia really was from France; the Marais as a bit chaste. The Leclair was definitely the most charming, especially as once DY was playing continuo it seemed that NPdC could unleash a more gracious keyboard style. The Beethoven was briskly stirring and over too soon. It took me a while to warm to the Schumann (I sometimes think that I only really like piano concerti) but by the end I had warmed to its Humor. It’s hard to beat a good Russian conductor in the Tchaikovsky and Alexander Vedernikov fitted the bill. I’m sure I’ve seen other Russians just stand back and hardly actually conduct the third movement at all. Is that a performance tradition in itself? There was only a smattering of applause at the famed clap trap which V. gently overcame. The last movement moved me to tears. And I have been twice to Bliss, the new opera by Brett Dean. This really is a big event: we don’t get new operas all that often in Australia. On closer examination, the publicity about the opera having been almost ten years in the making is something of an oversell. Nothing much can have happened between the initial conversations between Dean and Simone Young in 2000/2001 and early 2007, when Amanda Holden was approached to write the libretto. There are quite a lot of ironies about this work. Not the least which occurs to me is that, despite the implicit ridicule of Harry Joy’s wife (in the opera, Betty, in the book, Bettina) for her dream of New York, it is of course Peter Carey who has ended up there. Another irony, which an acquaintance of mine who really does seem to lead the Blissian life (home at Oberon; intermittent musical employment) pointed out is that, for a work which is touted as the next great Australian opera [possibly], musically speaking it has an awful lot of post-Webernian middle-European angst. During the second half of the second act, in particular, I kept on hearing bits of last act of Lulu. It’s a big undertaking. There is a spectacular (though ultimately theatrically economical) set. There is a chorus, and a “banda” of sorts. The curtain call revealed 13 principal singers. I’d probably say 11 because the 2 nurses’ parts were considerably smaller. I wouldn’t say, though, that it is a particularly singerly opera – rather, there is a lot of vocal acting, which is something a bit different. Peter Coleman-Wright is brilliant, and genuinely funny, even though I still can’t understand the point of the ballad of Little Titch with which he diverts the policemen after the being caught drunk in charge of his elephant-crushed car. The orchestral writing is terrific: constantly inventive and diverting. I was sitting too close to get the full effect of the soundscape. Coming out at interval the first time, I found difficult to care for any of the characters, because the characterisation is so schematic. Things picked up in the last act and at the second performance I attended. It really was better the second time around, but there remained points when the opera went for psychological depth (especially in relation to Harry’s daughter, Lucy) which ended up feeling like a loose end, partly because there wasn’t time to prepare or resolve it. And yes, in anticipation of any rejoinder, I recognize I’m rather unfairly having it both ways here. Either Dean or Holden comments [in the program: for once I bought one] that at heart the novel and hence the opera is a love story. After coming to serve Harry Joy’s needs at the Hilton Hotel, call girl Honey B sings something like: “Usually I don’t feel anything, but with you…” Perhaps I just have too much difficulty with the idea of a prostitute-with-heart-of-gold, because that just made me think: that’s what they always say. At the (rewritten from the novel) end of the opera, Harry Joy is in sylvan bliss, planting trees for Honey B. After they roll around in the dirt together for a moment, Honey B gestures to him where the next seedlings are to be planted. My cynicism intruded: I fancied that Honey B should be dressed in her working-girl gear and waving the car keys as she sets off to the city to meet the next client. Something and someone still needs to pay the bills. Maybe that will be the Christopher Alden production. Looking back over Glebe Island from the foot of the little foot/bike bridge at the beginning of Victoria Road, Rozelle. It’s a bit disappointing that the picture comes out so small within the post, but you can always click on it for a fairer view. Have been selected as the “talking heads” for ABC2’s series of live broadcasts of operas. Plenty of people have complained about this, one way or another. Just what have they got to do with opera? What do they know about it? Obviously, it’s meant to get the book-club and the yoof audience in. It’s at about 1 hr 46 of the broadcast. Before that, you can see Peter Coleman-Wright wondering just how long JB will detain him. In the end he’s forced to tell her that he needs to get to the loo after 90 minutes on stage. On Tuesday night to Opera Australia’s Midsummer Night’s Dream. This is one of my very favourite operas. It has probably supplanted the play itself in my affections, at least judging by my disappointment at the last performance I can definitely remember seeing. That was directed by Kim Carpenter in 1985 in the dying days of the Nimrod Theatre at the Seymour Centre with, from memory, Hugo Weaving as Oberon. I first saw it in the production directed by Elijah Moshinsky for the Australian Opera in 1978. (Prior to that, apart from some visits by the English Opera Group, Britten productions in Sydney were sort of cornered by Roger Covell’s UNSW Opera – I caught the last of these that same year – The Turn of the Screw.) James Bowman, as Oberon, looking a bit like a red indian or, for that matter, Neil from the Young Ones, came down from the flies on a kind of swing. There was water and splashing around. It was a musical and to me at such a tender age theatrical revelation. That production was revived. The young Toby Cole was one of the fairies one revival. That must have been in the early 80s. 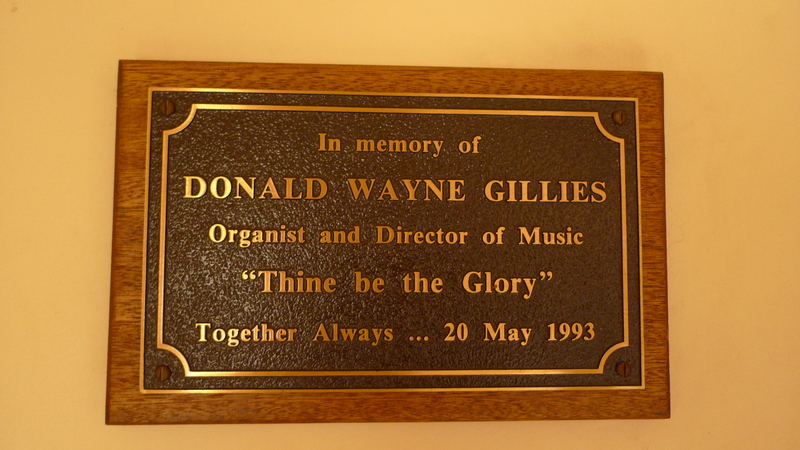 The present production dates from 1993. Tobias Cole now returns as Oberon. I’m sorry to say I was a little underwhelmed by this revival. Perhaps I have seen the production too many times to be delighted by its inventiveness. The humour and busyness seemed even broader than I recalled. For example, I would have preferred a little more faith to be put in the musical values of the operatic parody in the last act: Thisbe’s lament can actually be musically moving, even though you know Britten is having you on. I wondered if on a musical front I am too imprinted by other approaches, including the first impression made all those years ago. What was particularly lacking for me was an adequate realisation of the magical moments. Cole’s diction as Oberon was stunning clear but ironically this made it all just a bit too matter of fact and detracted from the mystery – neither “I know a bank” nor the final lilting song of the fairies quite reached the mark. The test for me is how things feel at the end of the middle act: I was willing myself to reach the feeling of magic and nocturne which I think is its goal but the music just didn’t quite get me there. If a finger can be put on it, mine is pointing to Alexander Briger, who conducted. Were things just a bit too brisk? I’m not claiming any justification in group-think, but I do note that I am not the only one to had reservations of this nature (1) (2). Soon, it seems, we will be treated to a third instalment of the Underbelly franchise on our televisions, should we choose to watch. Former constable Wendy Hatfield would like to watch it now, because she has reason to believe that she has been depicted in the series as a person having a presumably corrupt relationship with the (then) young nightclub boss John Ibrahim. A tie-in book has already been published which, according to Ms Hatfield’s lawyers as reported last week, includes allegations that, while a police officer, Ms Hatfield had a sexual relationship with Mr Ibrahim “a notorious criminal”, that Ms Hatfield had been promoted within NSW police ranks by giving sexual favours and that she was guilty of perjury. The important thing to remember here is that, when bad things are said about a person, they are ipso facto defamatory. It is then up to the defendant, if sued, to justify them (ie, prove them to be true) or otherwise excuse their recounting of them as arising out of some kind of privilege (public interest, reports of parliament or court proceedings, etc). The tricky aspect here for the producers of Underbelly is that the programs are not entirely true, so privilege may be a difficult thing to invoke and establishing the truth of particular imputations may also be hard. What they probably have to do, if they are to be on the safe side, is to produce a fiction where the fictional parts are innocuous and do not worsten the bad but true things which are said about the real-life characters who resemble the often quite thinly fictional characters, and where any true characters who are total baddies are just so bad that there is no chance of their suing at all. The prevention of publication by an injunction is extremely exceptional. This is normally thought to be a matter of free speech implications, since otherwise the powerful could readily muzzle any criticism of themselves. Certainly, if there is a whiff of a defence, publication will not generally be enjoined. That doesn’t mean that a well-timed threat and the risk of upsetting advertising revenue might not have proved profitable to Ms Hatfield and, indeed, of more use than waiting for years after the event for compensation for the defamation which had long ago been streamed into the living rooms of millions. The producers of “Underbelly” are of course awake to these risks. They like to back up the things they say about even semi-fictional people with the necessary extracts of court transcripts. In this case, they have had considerable recourse to the proceedings of the Wood Royal Commission into police corruption. That’s where I think Ms Hatfield’s lawyers had a good card to play. That is because Ms Hatfield was a compelled witness, and as a purported protection against the inquisitorial rigours of a royal commission, evidence given by a compelled witness cannot be used against that person. Everyone thinks that this is to do with criminal prosecution or other proceedings against you as a defendant, but why should it not extend to use of that material as evidence to justify the truth of statements made about you when you are the plaintiff in defamation proceedings? As the SMH has reported, Ms Hatfield’s application for preliminary discovery was dismissed by Justice Harrison yesterday. Ironically, it’s all great publicity for channel 9 and the program makers – they’ve been supplying the photos of the actress and possibly also of Ms Hatfield for use to illustrate the newspaper stories. The judgment is pretty complex, and having read it I find myself running out of patience to explain it. One thing which it reminds me of is the decidedly bare-knuckle manner of defamation litigation – all sorts of ridiculous points tend to be taken and argued on both sides in a way which is probably more familier to comon law and criminal lawyers than those like me who are more from the equitable side, and matters are commonly denied in pleadings which in commercial cases would be more likely to be not admitted at the highest. To cut a long story short, there are three main points in the judgment I want to comment on. On the first two, I think Justice Harrison’s decision is questionable. On the third, he probably got it right even though it seems a bit tough on Ms Hatfield. At  to  his Honour let the passages of Royal Commision transcript in by analogy to those cases where somebody waives an objection to legal professional privilege (ie, that they don’t have to say what their lawyer told them) because they have blurted out in the witness box “but my lawyer told me…” or words to that effect. I’m not convinced that the analogy works and it has certainly gone beyond the facts of the Bayeh case cited where the party themselves used parts of the transcript. At the same time, there is something satisfying in the way that the baroque elaboration of the imputations claimed by Ms Hatfield’s solicitors about being exposed as a corrupt and hypocrite by reason of her denials to the Royal Commission have ended up playing against her. At  to  his Honour found that there wasn’t at present evidence that Ms Hatfield had already been defamed. The relevance of this was that, although what most people are interested in is whether she will be defamed big-time by the impending broadcast, she said, quite rightly in my view, that there must have been some publication already among and between the defendants and in preliminary publicity. Of course, until she sees the program, she can’t say how. His Honour’s decision seems to be based on the fact that she hasn’t proved that the program may have been watched by anyone at all. I doubt if, under the relevant rule, she had to prove that it actually had been seen by anyone. It defies common sense to fail to find that something which is likely to have been defamatory is likely to have seen by someone, which I think is all that is necessary. For that matter, even the script was probably defamatory (subject to any justification or privilege, as I said at the outset). His Honour was probably right at law to find [107 – 116] that it was unlikely that Ms Hatfield would get an injunction restraining the broadcast and that therefore it wasn’t necessary that she see the program now in order to try to get one. However, this still seems a bit rich and catch-22. The program’s been made – at least, I don’t understand the defendants to have denied that it is. Who knows how damaging to Ms H it will be or even how true or false? It’s not really public interest broadcasting; it’s entertainment. Of course, Channel 9 doesn’t want to be put over a barrel in this way, but it’s just a question of money for them. Defame-now-pay-later suits them very well. Why shouldn’t Ms H see it now and chance her arm in an application for an injunction if she wants to? PS: A colleague who is more experienced in the defo field than I had a different opinion. He thought that Hatfield’s bid for preliminary discovery (which as I have hinted, may well have been as a means to gain leverage for a threatened injunction which would have had nuisance value even if ultimately without merit) was a big try-on which was absolutely correctly slapped down by Justice Harrison for the reasons he gave. PPS On 8/4/10 an appeal to the Court of Appeal was dismissed. See subsequent brief post here (originally a mere post-postscript to this post). Sorting through my socks today, I managed to muster 26 reasonably plausible pairs. And there are about as many (or do I mean twice as many?) odd socks again after that relegated to the “odd socks drawer”, as well as a few in the wash. In my 20s, I used to darn my socks. It was one of those Sunday-afternoon pastimes, like writing letters, that seems to have gone the way of the dodo. Note to self: don’t buy any more socks. 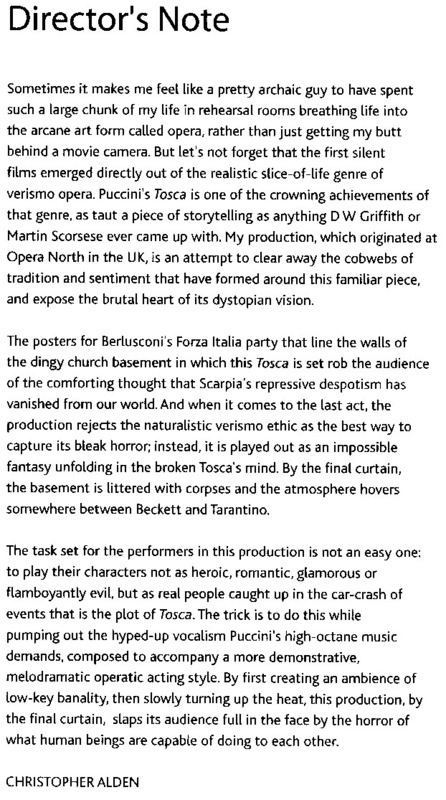 Last night to Opera Australia’s Tosca. Some news of Christopher Alden’s production has gone before it, so I can’t say I wasn’t forewarned, though I went without any particular preconceptions and didn’t really think of myself as warned at all. Perhaps I should have read the note printed on the back of the cast list more carefully when Sarah Noble posted it on Prima la musica. For ease of reference I reproduce that below. The production is set in a basement strewn with broken pieces of religious tat and, oddly, a confessional at the rear which is later used as the torture antechamber. A bunch of choir boys come in to get changed for a Te Deum in Act I, but what we then witness is the sacristan, for some reason, announcing the amount (but not, it seems, the ticket number) of a lottery jackpot. That’s Act 1. In Act 2, as already mentioned, Cavaradossi is tortured with power tools in the confessional. The starting and stopping of the torture is rather neatly signified by the plugging and unplugging of the extension chord in the wall socket. He is finally bashed to death (as we subsequently learn) by the torturer in a kind of control room or stage door booth occupied by the sacristan. Tosca does not seem to be aware of this and bargains with Scarpia for a safe conduct and all the usual stuff about the fake execution. Scarpia has stripped down to his undershorts and is getting stuck into Tosca (also by now down to a slip) when she stabs him to death with a Stanley knife. Scarpia’s henchmen sit through all of this facing the back of the stage. In Act 3, the shepherd boy’s song is sung by a person identified as the Marchesa Attavanti who at some point in Act 2 appeared on top of the confessional box. Tosca sits in a kind of trance next to the grill (the confessional grill, that is) and at some point Cavaradossi also gets up and goes near her. Apparently this is all a dream. The sacristan takes Cavaradossi’s ring and has a bit more business with the cafatiere and cigarettes. Scarpia’s henchmen shoot Tosca. There is so much in Alden’s program note which infuriates me, that I hardly know where to start. However, see my afterword below. Let ‘s just say, if he has to tell us the last act is a dream (and how lame is that?) then something has gone terribly wrong and it can’t all be the audience’s fault. If you set out deliberately “creating an ambience of low-key banality” you run the risk of simply being low-key and banal. In fact, that is my main grudge with this production. The second half is better [than the first, that is], as second halves so frequently are, but that is almost synthetically achieved by so lowering our expectations and spirits in the first half. Really, it’s vandalism. And what is even more annoying is that on Alden’s part it is bloody condescending vandalism as well. These days many opera directors are anxious to rob us of these kinds of comforting thoughts: but who thinks them? I have never met anybody under the delusion that repressive despotism has vanished; anyone suffering from it would need to live in comfortable isolation from all the media, even Berlusconi’s media. At the risk of turning moraliser myself, it is not accurate or sensible to equate the Berlusconi government and Scarpia’s despotism. I wish I could have put it so well. It was what lay behind my accusation of condescension, though it has occurred to me it may be more a matter of a fatuous epiphany which is really just the bleeding obvious. Tonight to the first of the SSO’s International Pianists series, featuring François-Frédéric Guy. For encores, FFG played another Chopin Nocturne, the “no 20” op posth., (fittingly, in C# minor to follow the ‘Moonlight’) and then Brahms Intermezzo Op 116 No 2. For what it’s worth [I am not a critic], I thought the ‘Tempest’ was the best on the night. The Op 110 was a bit too mellifluous for my taste. The ‘Moonlight’ was marred by a virtuoso cougher just behind me [two or was it three loud barks in the last few bars of the first movement] and also, as with op 110, not quite spiky enough [not in the anglo-catholic sense] on the rising figures in the last movement, though of course I enjoyed it. The choice of Chopin nocturnes was notable in avoiding any compound time nocturnes at all – in fact I thought the Chopin encore was the best of this composer. Mr Guy’s coiffure was worth the price of admission alone – on my part that is envy speaking. Despite my carping (which I accept is a matter of taste) about his op 110, I’m looking forward to his Beethoven concerto next week. But the big headline for tonight, which took me aback, was the full house. Such an attendance at the piano recital series hasn’t been seen since – well, probably since Lang Lang. Was it the 7pm start? (If so, I gnash my teeth, because we can expect more of the same quite contrary to my own preference.) Was it the particular program or pianist? Was it the fact that the SSO is apparently now offering mix-your-own subscriptions? I met one couple tonight whom I’ve previously run into more often at the opera. They were there on the strength of this and doubtless there were others. One thing it may have been is the marketing to the Chopin bicentenary. Every concert in this series features some Chopin, and one program (Garrick Ohlsson’s) is all-Chopin. Perhaps, rather as we had, in the wake of 1792-1992, ‘Mostly Mozart’ concerts (which vestigially survive in the SSO’s “Mozart in the City” series), this will spawn an afterbirth of “Chiefly Chopin” concerts. I don’t want to diss Chopin, but it does seem a distortion that the other bicentennialist, Schumann, doesn’t rate a mention in this year’s piano series at all. It’s true that, unlike Chopin, he is not just a piano composer, but piano music is a big part of his oeuvre. If his piano music is awkward, well, that’s a charge against all of his music except, possibly, his lieder (which fall outside the SSO’s remit). Can’t someone from “Beyond Blue” or [jumping to conclusions here, I know] Syphilitics Anonymous speak up on poor old Robert’s behalf? You are currently browsing the Stumbling on melons blog archives for March, 2010.